OH - MY - G**!! 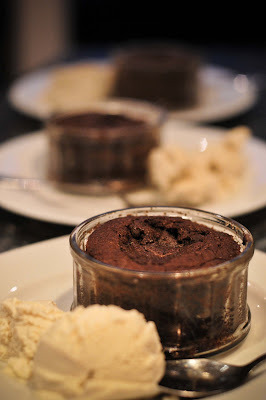 If you're a chocolate lover you will absolutely adore these heavenly Choc puds! I've mentioned before that I'm not a chocolate fanatic, but everyone loves chocolate in their own way, and this smooth, pillowy, heaven in my mouth dessert has won my heart for a lifetime. Do as I did and make these the next time you have guests over for dinner. You will surely win them over. This recipe comes from my favourite cookbook "Good Housekeeping Cookery Book". I get so much inspiration from this book, but I didn't change a thing with this recipe. It's perfect as is. 4/Pour the melted chocolate mixture into the egg mixture, then add the sifted flour. Carefully and thoroughly fold everything together, using a large metal spoon. note: photo taken by Monique Napier, my dear friend who enjoyed this chocolate delight with me. MMMMMMMMMMMMMMMMMM,...what else can I say? fabulous!